A race of aliens who are non corporeal go from planet to planet looking for hosts. They come to Earth and basically take over human bodies. Now it’s believed that once they take over a body all memories of the previous inhabitant are gone. And there are some humans who have remain hidden from them and are basically a resistance movement. 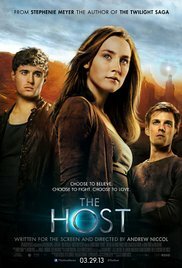 So an alien charged with locating them known as the Seeker captures one of them a girl named Melanie and puts one of them who is known as Wanderer in her body, in hopes of finding out where the humans are. Maybe it’s just me or it’s this damn hot weather that made me feel languid this week, but I thought this movie really wasn’t that bad. The idea of ​​an alien civilization (Yep, that’s the SF part) invading earth and taking over human bodies to improve earth’s environmental and social conditions by creating a healthier and more peaceful world, actually sounds both interesting and intriguing. There’s also the struggle between Melanie and Wanda: it’s a mental jousting in a way. The acting was not of the highest level, but the scenery in the movie was exquisite. There are several movies that couldn’t keep my attention. For once aliens weren’t portrayed as being violent murderous creatures. This was confirmed when certain aliens remind Seeker Lacy she’s a bit too obsessed in her procedures and even shoots (accidentally) one of her species. The fact that it eventually turns into a love triangle is something that pubescent teenage girls will be thrilled about. You can say it’s a SciFi for chicks, as someone described on IMDB. The ending was predictable again, but in general it fitted perfectly with the rest. All in all it’s not a stunning film, but then again it’s not a total crap movie either like some critics make of it. I didn’t know it was a movie made out of a book by Stephanie Meyer. I’m glad I didn’t know, because I think the whole “Twilight“-stuff is rubbish and otherwise I probably wouldn’t have watched this movie. Prejudices are sometimes a bad thing.